Single component, waterproof surface sealer for walkways, stairways, steel, fiberglass, concrete and wood decks. Designed for permanent flexibility, toughness and abrasion resistance. NW ‘Z’ GRADE is a premium quality single component waterproofing coating for concrete decks, walkways, and stairways. It is also used on steel, fiberglass, and wood decks. It is solvent-based and may be applied in any temperature range. NW ‘Z’ GRADE is designed for permanent flexibility and toughness, abrasion resistance, and to bridge and move with hairline cracks, and to resist impingement attack. It may be used in marine or industrial situations and in constant submersion conditions. Restores the surface of fiberglass water slides and exterior GRP fabrications. Waterproofs planters and landscaped concrete areas. Can be used over concrete, fibreglass composites, insulation, most metals, mineral composites, wood, wood composites, rubber, plastic composites and other surfaces. Surfaces must be dry, free of dirt or loose debris, and free of oil, grease, or any substance that would interfere with adhesion. All repairs of damage or defects must be made prior to product application. NW ‘Z’ GRADE is applied straight out of the can after 2 minutes of gentle low speed mixing or stirring. Apply the product using brush, roller, or spray technique. 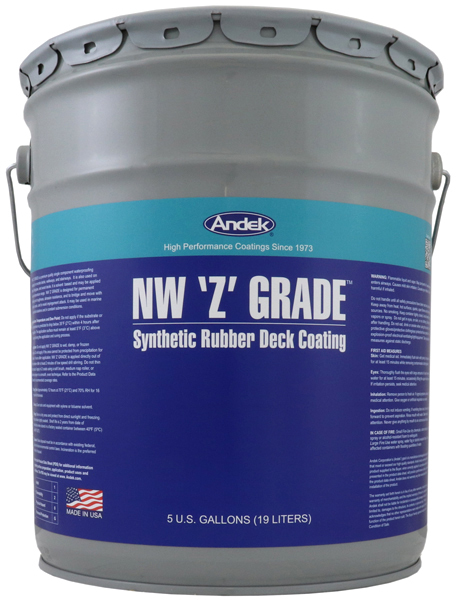 Apply NW ‘Z’ GRADE in a smooth, even fashion to achieve a uniform coating thickness 2 coats. Allow sufficient ventilation to promote thorough drying between coats and before service. Drying time in well ventilated circumstances is 12 hours at 70°F (50% R.H.) for 16 mils wet film thickness. NW ‘Z’ GRADE should be used with the following equipment specifications: ratio 30:1 or 40:1 and a #35 or larger tip. Clean tools and equipment with xylene or toluene solvents. Do not apply to wet or frozen surfaces that are saturated with moisture. Proper surface preparation is important to product performance. Shelf life is 24 months in unopened cans stored indoors. This product is flammable. Keep away from sources of heat, sparks, and flames. Use only EP rated equipment.